Combining with the hot Virtual Reality technology, watching 3D movie anywhere anytime has become reality for everyone now. No matter what brands you own the VR devices, ranking from high-end $799 HTC Vive to $20 low-end toylike Google Cardboards, you could pretty easily watch a 3D movie with a VR headset from the comfort of your home, no longer needing sophisticated heavy CRT TV screens. If you’ve already got a Pixel or another Android N phone, but you don’t like to fall into totally low-end VR views, I would say, certainly $79 Google Daydream is a daily inexpensive entry to a very nice VR experience. The 3D pictures of Google Daydream is very clear, and the size of the viewer was just about right. So, we will quickly walk with you through how to play 3D movie on Google Daydream friendly, as if you were watching a movie on a big-screen TV that just happened to be on your head. ➤ Part 1 The requirements to let 3D movies play on Google Daydream? ➤ Part 2 How to Convert 2D/3D movies to Google Daydream VR? ➤ Part 3 how to transfer 3D VR videos to your Pixel/Android phones for viewing on Google Daydream? 1. A 2D or 3D movie. If no 2D movies existing and you don’t like to buy a 3D movie from Amazon or Plex, you could use the 3rd party APP as 3D movies maker shortcut such as Dimo Video Converter Ultimate to help you convert 2D to 3D quickly. 2. A phone. No matter what Android or Pixel you have, the working one will be OK which I’m sure your phone in hand can perfectly fits the Google Daydream. The one extra thing you might need, depending on the 3D movie you have, is an app to play it for the Google Daydream. The reason you need a special app — VR player (there are top 5 free VR video players available for options) to play a 3D movie because when you play any sort of video that’s meant for a VR headset, it’s split into two windows. However, if the VR players failed to play your ready-made 3D videos on Google Daydream, there are several factors to consider, including aspect Ratio, resolution, duration and video format. Different VR video players might have different supports for video formats, resolutions, aspect ratio, etc., please refer to the best video formats for different VR players and VR headsets to adjust and convert your 3D video formats by the help of Dimo Video Converter Ultimate. How to Convert 2D/3D movies to Google Daydream VR? Dimo Video Converter, a professional 3D Video converter and VR video maker, is the best powerful software of converting 2D/3D for Google Daydream VR. The program is easy to use and can help you encode 3D to MP4, MKV, AVI, WMV, MOV, etc HD media formats with SBS 3D or Top-to-Bottom 3D effects. Best of all, this software allows you to fast convert any 2D/3D files to 3D videos such as MP4 Top-bottom 3D Video, MP4 Side-by-Side 3D video, which can be played on Google Daydream VR perfectly. If you are running on Mac, please turn to Dimo Video Converter for Mac, which allows you to convert 3D to Google Daydream VR on Mac OS X(El Capitan and macOS Sierra included). In that case, if your 2D/3D videos are not in the formats supported by your VR players, you have to convert 2D/3D video formats in the following way. Step 1. 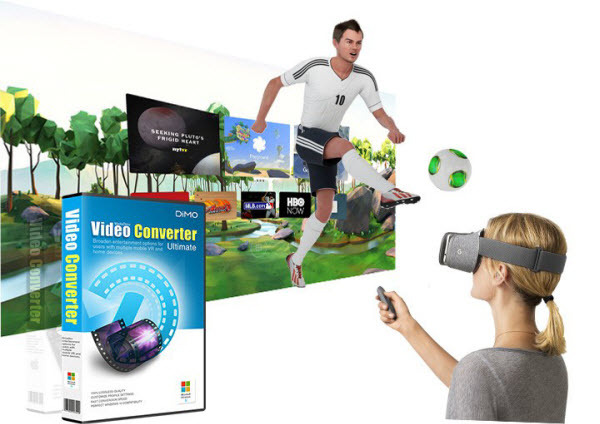 Download the VR video converter. Download Dimo Video Converter Ultimate on your PC (Windows 7 and Windows 10 included) or Mac (El Capitan included). Complete the installation and launch it. Click “Add File” to add 2D/3D files to it. 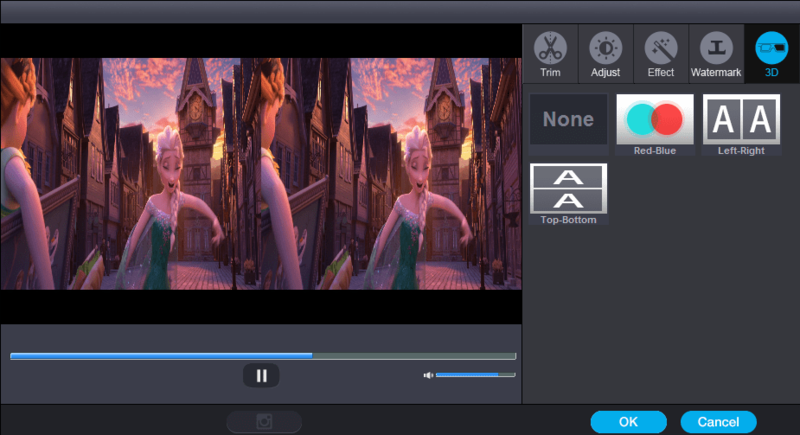 After the files are loaded, you can preview them by clicking its icon on the 3D conversion task bar to activate the build-in video player; And if you like to take snapshots of your favorite movie scene, then please hit “Edit” and tap camera icon to get pictures by screenshot. Step 3. Choose an output 3D VR format. Based on the support range of your VR player, choose an output video format. 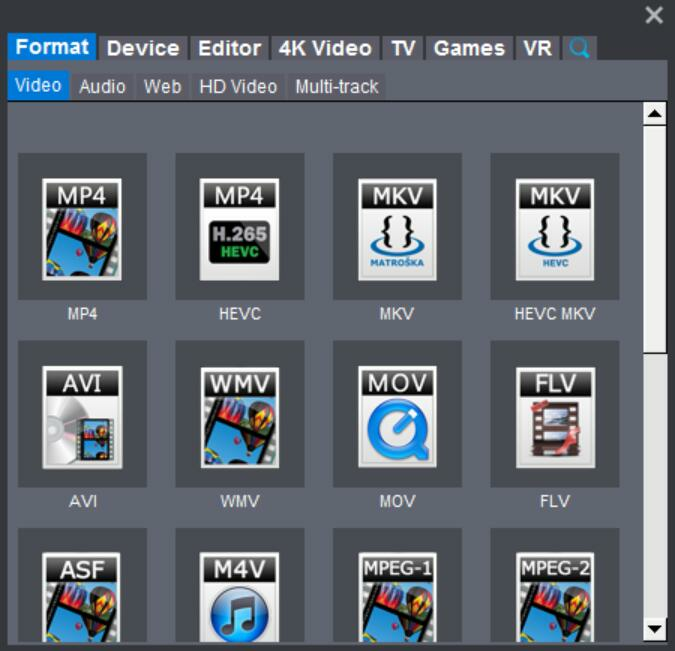 This VR video format converter embraces almost all video formats and has 410+ built-in profiles for Google, Apple, Android, Microsoft and Sony devices. MP4 is recommended for Google Daydream VR. You are enabled to adjust the bitrate and resolution parameters for different needs. You can define the Destination Folder for saving the output 3D VR file and set everything (e.g., encoder, trimming or clipping, merge videos). Afterwards, you are good to go by tapping "Start" button. The converted 3D VR video can be in the best format and played by your VR video player on your Pixel/Android phones or device after a time. After conversion, how to transfer 3D VR videos to your Pixel/Android phones for viewing on Google Daydream? Solution 1 Using free function “Media Server” of Dimo Video Converter as well to copy 3D VR videos to your Pixel/Android phones wirelessly. Based on advanced IP address sharing technology, you can get rid of any extra USB storage or MicroSD cards. 2. Click “Browse…” to load 3D VR videos to Dimo Video Converter program, and press "Share" to generate the sharing IP address, then input http://IP:PORT like "http://192.168.1.109:8868/" (without quotation marks) into the address bar of the browser. What’s more, you can free transfer VR movies from computer to iPhone with “Media Server” of Dimo Video Converter Ultimate including its trial version. Besides, this tool is designed to transfer photos, music, ringtones from computer to mobile devices such as Android phones, iPads, laptops, home theatre projectors, TVs etc. Solution 2 Using MicroSD card to copy 3D VR video files to Google Daydream. On your MicroSD card file directory, navigate to Daydream> Movies > Your Movies; Create a new folder within "Your Movies" and label it "3D"; Import or move your converted 3D videos into the newly created folder “3D". 1. Navigate to Daydream VR player from the main menu. 2. Navigate to "My Videos" from the content library menu. 3. Select the 3D video you wish to view (if you followed the above steps it should have a "3D" label in the upper righthand corner). Can I Play 3D MP4/MKV on PSVR?